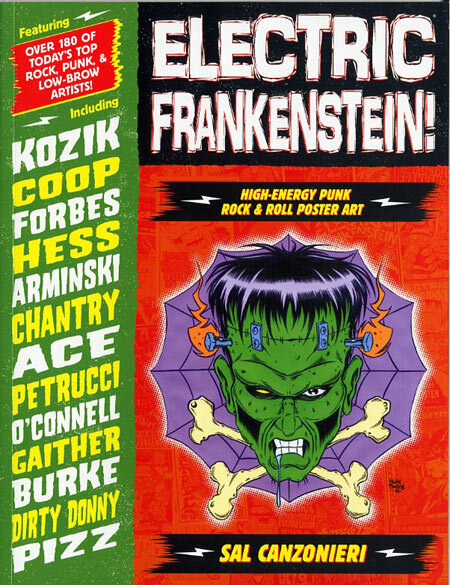 Music Poster Books - Electric Frankenstein! This is a different type of book, most are random collections of groups from a period, geographical area, or an illustrator. This is a collection based around one band, Electric Frankenstein. Over 180 different artists are represented in this collection, all of whom are listed at the back of the book with contact info. The book is not indexed and the posters don't appear to be arranged in any particular order. There's also a gallery of the picture sleeves and album covers which are as well done as the posters.